Club Penguin Cheats by Mimo777 Club Penguin Cheats by Mimo777: Club Penguin Pin Cheat - GOLD FEATHER PIN and CARROT PIN! 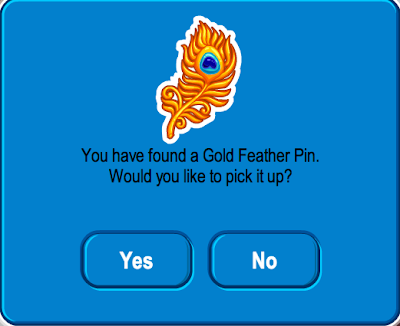 Club Penguin Pin Cheat - GOLD FEATHER PIN and CARROT PIN! That's right, there are two pins to find this week! Coolio! 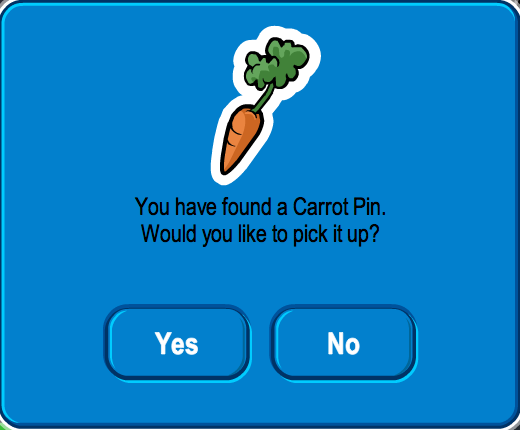 Here is how to find the next new Club Penguin CARROT PIN cheat. Step 2. Now go to The Night Club. NOW YOU HAVE THE NEWEST CLUB PENGUIN PINS! Woot! Gotta love having more than one pin, right? y is there 2 pins? thats so ackword! how are peps apost to keep up with that? Btw, about your other post. I have always known there wouldnt be water and ice ninjas. There are more spots on the amulets, plus, near the volcano in the backround of the dojo court yard, you can see a waterfall, and mountains covered with snow! 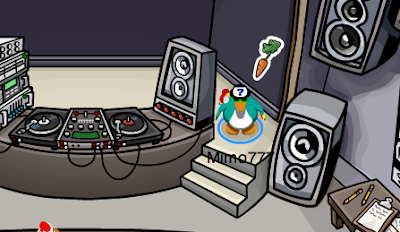 Did anybody else notice that Club Penguin's pins have been food lately? Whats up with that? So today I earned my 12/12 of Cart Surfer.Now I get double coins every time I play now! -indiana742 P.S Jackie499 I know you copied me. There are 2 pins because 1 is the Golden Feather for Secrets of the Bamboo Forest, and the other 1 is the normal pin that comes out every 2 weeks. Hope I helped. P.S. I have a friend who likes carrots! Club Penguin is soooooo boring I mean all it is is just boring and becoming a member is a waste of money all you get to do is play more games and wear clothes and meet people you dont even know (like rockhopper gary etc ) and they are just workers that work with disney and you can buy much more better stuff with money then memberships. Mimo do u know u could enter the brige at the play with the golden feather and get a free background its a girly background but it is still free so u might as well pick it up, huh? I like carrots too :D The feather pin is fro the play and the carrot pin is just a regular pin. 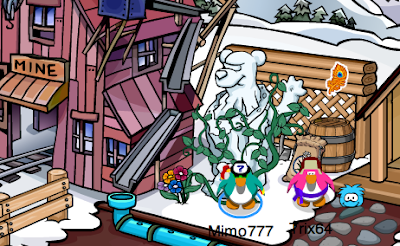 I think CP is just shaking things up a bit. Maybe its a glitch but I really don't think so. Don't you like the two pins? I do. I love the carrot pin, its awesome! What do you think of Club penguin "Bay-bays"? Hey Mimo! Wanted to tell you there is 2 two dos Hide 'n' Seek postcard check it out! Well, one of them is for the Stage play, and the other is just the daily pin. They can't cross the bridge if they don't have the Stage pin! Uh, technically, that's not a COMMENT... but that's your opinion. We like CP, and that's our opinion. 2 pins awesome!!! i like carrots! and i thought i would never find the gold feather pin lol. There are two pins because in the Stage, if you find the feather pin, you can get across the bridge there. It won't happen everyday though. There will only be two pins when that play is here. P.S. I like carrots too! Congratulations! I still have only 5/12, but I'm working on it. Also, it's kinda rude to talk about people that way. I was thinking the same thing! Maybe CP is making the pins during lunch and they make the pin something that was in their lunch! ") <--- P.S. that's my new smiley, like it? Not to be rude or anything, but please do not post personal opinions that are rude on. If you don't like CP simply ignore it, but we like it.